What Was That On American Idol » I Mean…What?!? Yikes...could he have had a worse outing? No. 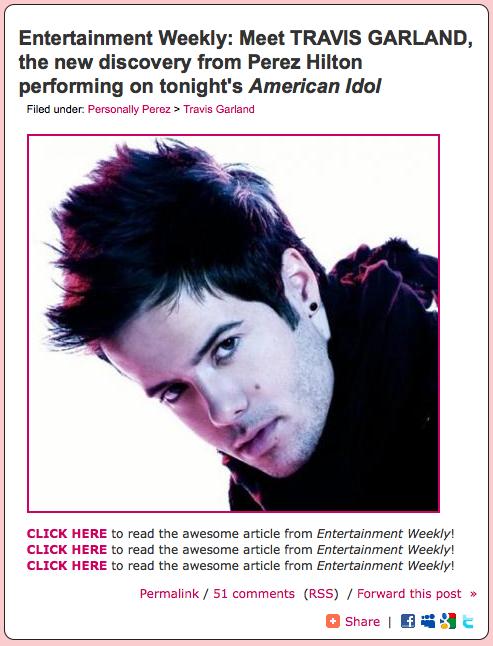 Perez Hilton was busy hawking his one-man, boy band, Travis Garland on American Idol and the end result was…yikes. Perez Hilton had the balls to compare this My Space novice to, “Justin Timberlake…only better.” The performance was sad. Sadder than punch actually. The dancers were fotz…and that girl titillating Travis was so stagey lame that I can not believe that no one stopped that routine before it was too late…as in making it to air. Give me a friggen break Marlene. Stop telling us how horrine Lindsay Lohan is and relax. Speaking of stagey lame, Justin Bieber came out to weasel his way back on top of the trending topics list from which he was bounced the other day. And for the BET Awards to nominate The Mini Biebe for an award proves that just about everything on Earth is up for sale. Right Usher? Next up…Bieber gets an NAACP Image Award.